Translator’s Note: Those familiar with Lafcadio Hearn will probably reconize his version of this story, recorded as Of a Promise Kept in A Japanese Miscellany. This is a shortened, less poetic version of the tale told just as a recap for the book Nihon no Yurei. 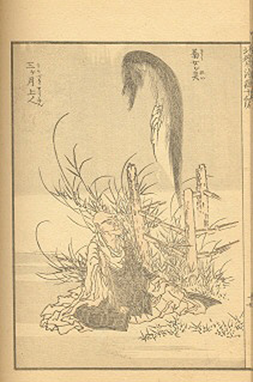 The story originally appeared in Ueda Akinari’s Ugetsu Monogatari. 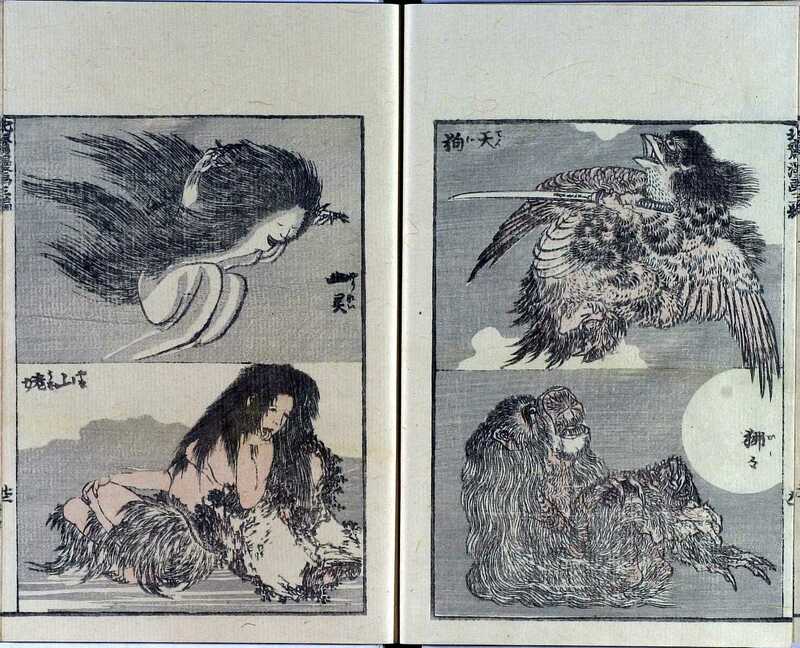 Here are three more yurei from Hokusai’s 15-volulme Manga series. Iga no Tsubone serves double-duty as an actual historical person as well as a folkloric figure. She was the wife of Kusunoki Masanori, an Imperial serving in the court-in-exile for the Emperor Go-Diago. The story goes that Sasaki no Kiyotaka was an unsuccessful advisor to Emperor Go-Daigo. Sasaki advised the Emperor to attack Ashikaga Takauji’s armies, despite the weakness of the Imperial position. The result was disaster, and Sasaki was ordered to commit seppuku, ritual suicide, as atonement. Sasaki’s yurei returned to haunt the Imperial court-in-exile after his death, appearing in the form of a tengu. ( It is not uncommon for members of the Imperial court to return after death as tengu instead of normal yurei.) The ghost of Sasaki no Kiyotaka tormented the court-in-exile, until finally the lady Iga no Tsubone confronted it in the palace gardens, and persuaded it to leave. By far the most famous ghost story of Japan, and the most famous ghost in Japan, this is a scene of Oiwa from the kabuki play Tokaido Yotsuya Kaidan. Oiwa was a woman cursed from birth with being ugly. Despairing of any happiness, she was finally married and had a baby with a poor ronin named Iemon, who eked out a living as an umbrella maker. Iemon somehow won the heart of the beautiful daughter of a well-off neighbor, and realized that the only thing standing in his way was his wife and child. He secured a vial of poison that he gave to Oiwa, which didn’t kill her but only caused her eye to droop and her hair to fall out. Disturbed, Iemon finally outright killed Oiwa and her baby. Oiwa returned to haunt Iemon and his new bride and family until she got her revenge. This image of Oiwa from the Yostuya Kaidan is highly unusual, in that the vast majority of pictures of Oiwa (and there are hundreds, if not thousands) have her facing off against her husband Iemon. Instead, in this scene she is confronting the Buddhist monk Yuten. In some versions of the story, it was this monk who supplied the poison to Iemon. Hokusai has another, much more famous print of Oiwa from his Hyakumonogatari series. 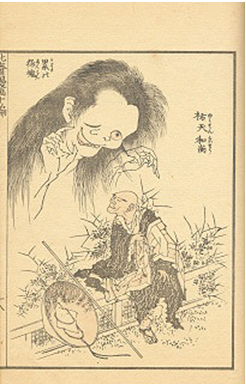 That image is the famous scene of Oiwa’s face appearing from a lantern to confront Iemon. Another of Japan’s most famous ghosts, the story of Okiku and the Nine Plates is usually told as the Bancho Sarayashiki. In the tale, Okiku is an innocent maid who breaks one of the ten plates that are the heirloom of the family she works for. In his wrath, the master of the house has Okiku thrown down a well where she dies. Every night, her ghost rises from the well and goes to the house to count the plates, shrieking horrifically when she gets to number nine. The story of Okiku has as many variations as there are old wells in Japan, each claiming to be the original. This picture is based on a version where a monk hid nearby when Okiku rose to count the plates. As she counted the plates, and reached the final ninth plate, the monk shouted “ten,”and Okiku, satisfied that she had finally finished her count, dissipated to the afterlife. Like Oiwa and Iga no Tsubone, there are several ukiyo-e woodblock print versions of the Okiku story. This is in response to a reader question about a particular yurei picture, specifically Hokusai’s manga yurei. Katsushika Hokusai is probably Japan’s best-known artist internationally. His print The Great Wave off Kanagawa, from the woodblock print series Thirty-six Views of Mount Fuji, is without a doubt the most famous work of Japanese art. Like most artists in the Edo period, Hokusai illustrated supernatural scenes from famous kabuki plays and popular hyakumonogatari kaidankai tales. In 1831, he created five prints in a hyakumonogatari series that are still some of the most famous Japanese ghost prints. The particular yurei in question, however, comes from a different period in his life. In 1811, at the age of 51, Hokusai changed his professional name to Taito, and began work on a series of sketchbooks and small images he called manga. The word manga (漫 画) translates directly to “frivolous pictures,” and Hokusai’s manga series were originally meant to be a quick money-making venture that would attract new students. The manga series was very popular, and Hokusai created fifteen volumes in total. 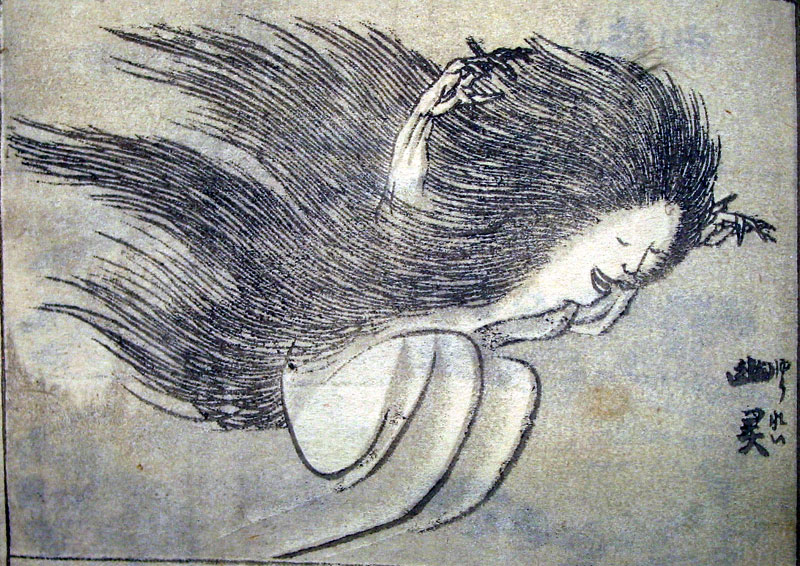 This yurei image comes from the 13th volume, one of the three not published during Hokusai’s lifetime. 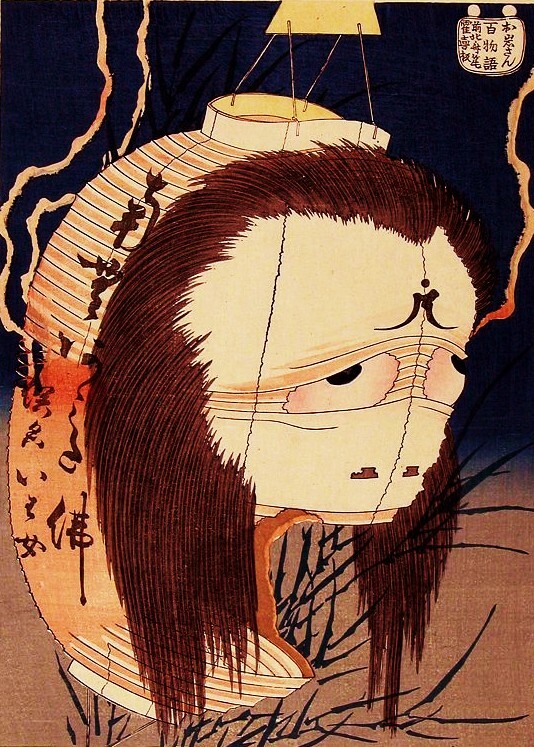 This yurei is not from any particular story, but just seems to be a “frivolous picture” of a yurei that Hokusai drew. The text next to the picture say simply yurei, with no other identification. 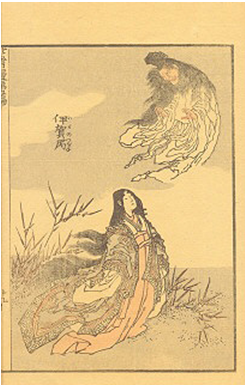 It is a very usual depiction of a yurei in that it is winsome rather than scary. But it does include the standard Edo period yurei characteristics of pale skin, white kimono, black hair, and no feet. 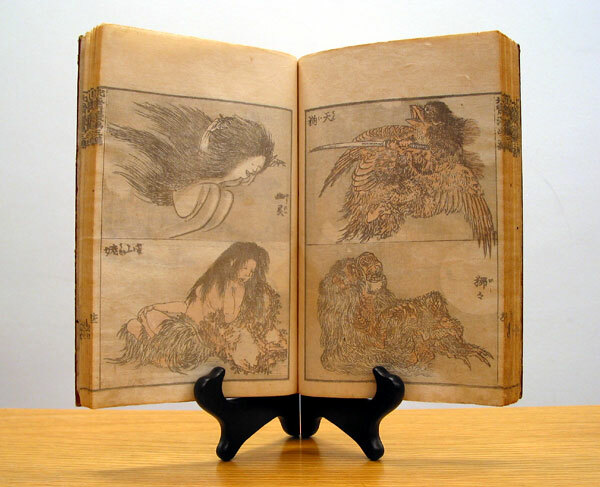 The yurei is part of a four-paneled series of mythological creatures. The yurei is in the top left, with a picture of a Yamauba underneath. On the right side in the top left is a tengu, and underneath that is a mountain yokai called a Hihi. Hihi is the Japanese word for baboon, and at the time a baboon was no less a fantastical creature than a mermaid or tengu. It is clear from looking at the original that the picture has been color-corrected. The original impressions from Hokusai’s manga series were three-colored, black, gray, and pale flesh.